A customer recommended we check these out, and boy are we glad we did! The Magic Hexa™ anti-vibration feet perform better than nearly everything else we have tried when it comes to stabilizing components and draining vibration away. The MagicHexa™ Audio Vibration Isolation damper feet are made from a proprietary visco elastic polymer that combines shock absorption, vibration isolation and damping characteristics to create the ideal acoustic damper and absorber. Its specially formulated Vibration Dissipating Aerodynamic honeycomb Configuration have almost 1,000 times higher damping coefficient than metal, thus reducing the transmission of various vibration energies into whatever surface the component is sitting on. The Magic Hexa™ will improve your audio and visual system's performance by isolating your component from vibrations on micro and macro levels. You will experience dramatically increased transparency, dynamic range, imaging and sound stage. 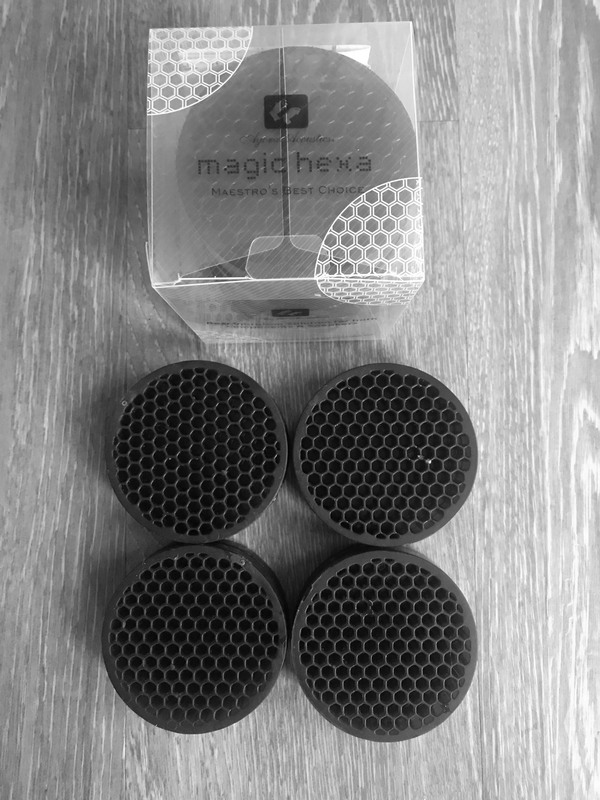 MagicHexa™ is designed for maximum absorption efficiency and damping of unwanted audible vibration. Unlike general rubber bumpers and footers, The Magic Hexa audio feet experience no deterioration of their physical properties by sudden changes in temperature, pressure etc. Minute embossment on the product’s surface and tacky treatment applied to prevent slides or unexpected fall of components. In particular, when the MagicHexa™ are placed between component and stand, there is a very stable system support as well as sound improvement. Great value and highly effective! Excellent and affordable tweak for isolation of components. Great product. Can't beat it for the price. Looks great. Performance is excellent. Very pleased. Buy with confidence, you too will be pleased. The Magic Hexas are an amazingly cost-effective tweak for vibration control and Michael's description to me of their effects was quite accurate. I find that they allow my system to sound cleaner and more open, with somewhat improved separation of instruments and voices. I also use 2 sets of Stillpoints Ultra Minis, which are even better, but the Hexas provide perhaps 1/2 the amount of improvement for about 1/10 the cost of the Stillpoints. Also, the Hexas under my heavy preamp and power amp are much more stable than the Stillpoints. Click the button below to add the MagicHexa Audio Vibration Isolation Damper Feet to your wish list.